February 2009 awards … congratulations! – Commissioner of the Month goes to jengoldacker who published a load of missions in February to do with painting various rooms in her house. We just thought we would give her US$50 as a contribution towards the cost of the paint! – Responder of the Month goes to Tracy for her many useful responses. What can we say? Tracy is relentless in her wish to help others. We need more people like Tracy! She will receive a special prize worth $50. – The February special grant goes to belindayoung who you will all know – she has been amongst the most dedicated missioners month after month. Whether she is publishing interesting missions of her own or helping others achieve their goals, she has most certainly not received the recognition she deserves. She also closes off her missions when completed – something we wish more people would do … it’s a good way to earn more points! We hope that Belinda knows that she is appreciated by so many of our community. Our grant to Belinda is worth US$200. If your mymission2 username appears above then look out for an email from us which will tell you how to claim your prize. If you haven’t yet received an email and you have checked your junk/spam folder then please make sure your email address is correctly entered into your mymission2 profile! Don’t worry – nobody will see it but we need it to be able to contact you. Congratulations everyone and happy missioning! January 2009 awards … congratulations! – Commissioner of the Month goes to rhiannonatkin who published this mission on 29th January: Get 250 members on my Facebook group. We love this mission because it shows how people all around the world can help to achieve things and it is all about social networking. Rhiannon will receive a special prize worth $50. – Responder of the Month goes to jacqui.tohc for her many useful responses regarding food. Being so helpful is what mymission2 is all about! Jacqui will receive a special prize worth $50. – The January special grant goes to PAG who published this mission on 11th January: Recover fully from a heart attack. PAG has been very active within mymission2 for a long time and we think it is about time that he received some recognition. We hope too that his recovery is going well. Our grant to PAG is worth US$200. December 2008 awards … congratulations! – Commissioner of the Month goes to robertburnes who published this mission on 11th December: Try to get 2 MyMission2 T-Shirts. I’ve said it before and I’ll say it again … we like missions like this! Robert will receive a special prize worth $50. – Responder of the Month goes to belindayoung who has consistently been a very helpful and considerate missioner and who has excelled herself in her responses about promoting mymission2. Belinda will receive a special prize worth $50. – The December special grant goes to rhiannonatkin who published this mission on 11th December: Promote MyMission2 at my craft stall. Thanks very much to Rhiannon for promoting mymission2 at her craft stall. The question is … will she spell out mymission2 in beads at her next stall as per Jacqui’s suggestion? Our grant to Rhiannon is worth US$200. I wonder if Rhiannon sells her crafts online and whether we can help promote them? – Commissioner of the Month goes to moseswaruiru who published this mission on 14th November: Find out how I can refer people to mymission from my email directly. We like missions like this! Moses will receive a special prize worth $50. – Responder of the Month goes to robertburnes who went to considerable effort to provide absolutely loads of responses during the month. Robert will receive a special prize worth $50. – The November special grant goes to jacqui.tohc who published this mission on 29th November: be a successful author, whose work motivates and inspires. Jacqui is quite an inspiration to everyone. She’s had a tough time with her health over the last 13 years but her strength and courage have enabled her to achieve more than most of us can even dream of. Not only did she volunteer to model in our Beat The Credit Crunch 2009 calendar (Jacqui is Miss July!) but she has also written not one but two cook books: Travels With A One-Handed Cook and Cook, Eat, Be Happy! You can buy her books by clicking on the links. Our grant to Jacqui is that we’re going to put $200 towards advertising her books online. If your mymission2 username appears above then look out for an email from us which will tell you how to claim your prize. If you haven’t yet received an email then make sure your email address is correctly entered into your mymission2 profile! Don’t worry – nobody will see it but we need it to be able to contact you. Tracy’s special grant – the handover! Many congratulations to Tracy who won the mymission2 grant in October. 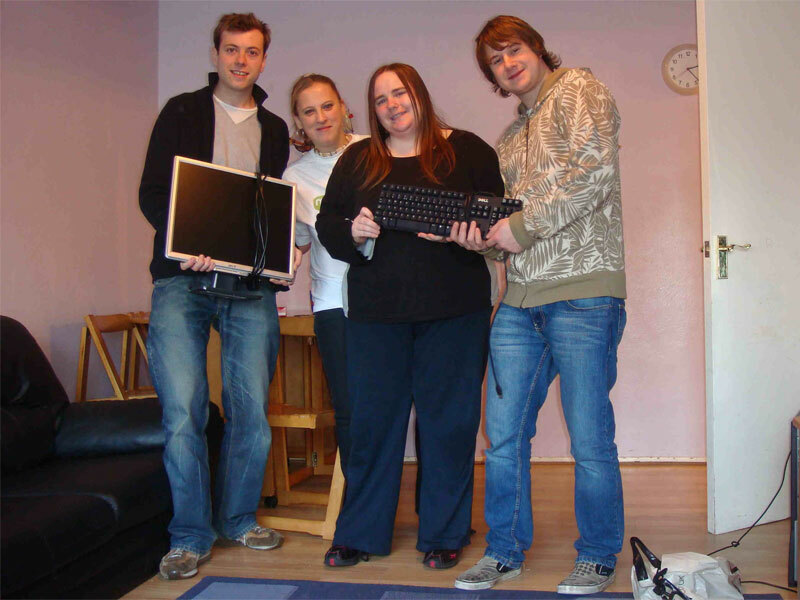 Publicity Activist Halliday and Mission Controller Chris paid Tracy and her friend Laura a visit to hand over a Dell PC with monitor.